TMJ neck pain is a symptom related to dysfunction of the ultra-strong temporomandibular joint. This is the structure that hinges the jaw to the skull. The TMJ is formed by the joining of the temporal bone and the jaw bone. There are many theoretical causes of pain in the temporomandibular joint. Pain is usually deemed to result from muscular issues in the structures that control the opening and closing on the mouth. These types of temporomandibular dysfunction (TMD) are usually related to myofascial pain syndrome that is experienced regionally. Other cases of TMD are deemed to be caused by a problem with the joint itself, including arthritic and ligamentous changes that actually change how the joint functions. A minority of TMD conditions are linked to disease processes, such as temporal arteritis. These represent the least often seen forms of TMJ symptoms. Regardless of the cause of discomfort in the temporomandibular joint, only a very small percentage of patients will experience pain in the actual neck anatomy. Instead, most will suffer pain in the immediate vicinity of the joint itself or pain that is referred into the face, the ear or the temporal region of the skull. This discussion will provide insight on the nature of neck pain that might be linked to TMJ disorders. Most TMD symptoms are experienced directly in the temporomandibular joint itself. This type of pain exists in the direct corner of the jaw, where the skull and mandible meet. Pain is typically experienced upon jaw movement, although the exact parameters of this activity-related symptomology might be very case-specific. Most patients will have some degree of discomfort with any movement, with pain growing in intensity as the jaw works harder to chew or longer in activity duration. However, some patients only have pain upon particular jaw movements. A great number of patients have regional pain that encompasses large areas of the face, typically around the mouth, into the cheek and as far up as under the eye. Likewise, many patients suffer referred ear pain, wherein the symptoms actually might be mistaken for a separate problem inside the anatomy of the ear itself. Patients who experience referred pain from the corner of the jaw into the side of the neck and under the ear are in the gross minority. However, these patients can often be confounded by their symptoms and may undergo a vastly different diagnostic process if they feel that the cause of the pain resides in the neck, rather than in the TM joint. 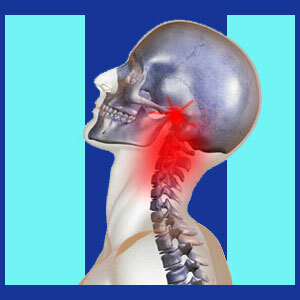 For people who do suffer TMD symptoms in the neck, the locations are usually strikingly similar. Virtually all will have pain in a linear path parallel to the jawline, extending from the jaw to the back of the ear. Pain will almost always be chronic in nature and will often worsen with facial muscle activity, such as chewing, talking or grinding teeth while sleeping. Some patients might experience headaches along with the neck pain, or might also suffer more traditional symptomatic locations for TMD, including in the face or within the inner ear. Patients who demonstrate neck pain that might be related to a temporomandibular joint concern are warned to properly report all symptoms to their diagnosticians, in order to save time and testing for many conditions that might be deemed possible causes, given an incompletely cited list of symptomatic factors. While TMD is a controversial condition, there is no doubt that the pain it causes is very real, although the causes and symptomatic locations can be very individualized and different in expression from patient to patient. The temporomandibular joint is very strong and well-designed, but can suffer degeneration and injury, just like any bodily structure. When this occurs, pain may result from joint problems, ligamentous problems, muscular problems or neurological problems and all of these symptoms might be strikingly similar, regardless of stemming from a variety of unique causative processes. It is worth mentioning that some cases of TMD are certainly caused by a mindbody process and not a structural defect of any sort. To learn more about how TMD symptoms can be expressed in the side of the neck, consult with your physician or see a specialist in TMJ disorders for expert guidance.